Preparing ahead of time for an architectural photography shoot results in better photographs, an easier shoot and it prevents costly delays. Paying attention to detail, having a schedule and collaborating with your photographer keeps everyone happy makes the shoot fun! Here are 10 ways to prepare for an architectural photo shoot. To simplify your planning I’ve broken it into two categories — interior photography and exterior photography. Ensure good communication and coordination between various departments like Security and personnel in areas being photographed. Notify relevant personnel several weeks in advance of the shoot times and locations. Notify them again just before and on the day of the shoot. On shoot day remind the Security Department of the shoot and have security badges ready for the photography team. Notify staff when the shoot will be over and when they can resume their normal work schedule for each area being photographed. Are certificates of insurance required or are their specific union regulations? Your photography team may need to adjust the lighting. Consider whether special permissions or service personnel need to turn lights on and off, operate computer controlled lights and access the circuit breaker. Prior to the shoot, inform the photographer about the different types of lighting in each area being photographed. Typical lighting includes sodium, tungsten, fluorescent, halogen, LED and sunlight. You may need to have an electrician or building engineer on standby to operate or replace lights. It may be necessary for the photographer or his assistants to move furniture, remove items from the room or rearrange furniture and decorations to create the most pleasing composition. 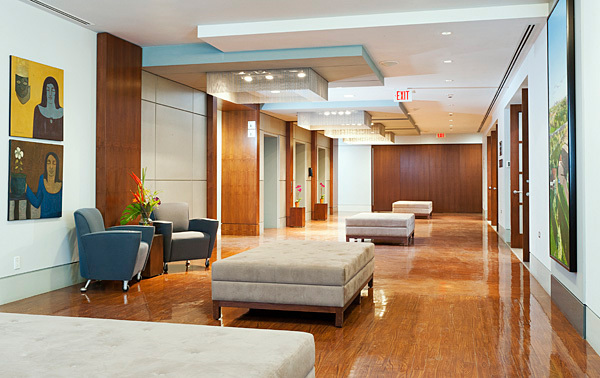 In vacant or new buildings photographers can source furniture to fill in the shots. The photographer can work with your interior designer, consult with one of their own or work directly with a furniture supplier. Consult the photographer about whether you want actors or models in the shots to add a human element. Involve the photographer early on in the talent selection process. Photographers often have access to pools of talent at discounted rates and should know the best places to source models. Don’t forget to consider parking arrangements. The photographers will require parking and access to loading docks and/or ramps so they can unload/load their equipment onto the premises. Send directions on where they should park. Have parking passes ready for each vehicle in the photography crew. A cleaning crew should complete a cleaning just before an area is photographed. They should especially clean shiny surfaces like windows, tables, furniture and floors. If you don’t have a cleaning crew consider hiring one for the shoot, they cost much less than paying a photographer to clean the premises and it’s much more efficient. Just in case tell your photographer where cleaning supplies, vacuum cleaners, ladders, and light bulbs, etc are located. Most of the guidelines for interior photography also apply to exterior photography. In addition plan for the structure, property and traffic safety . The photography team needs to be aware of any construction, window washer or landscaping activity taking place during the shoot. Lighting is really important so make sure someone from the studio has access to the interior of the building to adjust interior and exterior light levels, move furniture or adjust window blinds. The photographers may need to rearrange or remove decorations or signage. A Landscaper or Maintenance crew should be available to help with this. If a member of the staff is not on standby during the shoot, the team will need to know about fountain controls or sprinkler timing controls should they need to be turned off. If necessary, notify the local police department and/or Traffic Department if the photographers will need to control customer or tenant parking. You may need to hire the police or a road safety crew to control traffic for the photo shoot. Being prepared ahead of time with the answers to these questions can ensure a successful shoot.